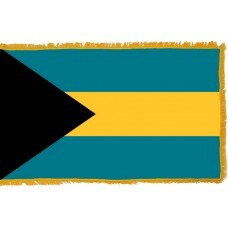 The Bahamian flag consists of 3 horizontal bands with the colors, aqua blue, yellow, and aqua blue. On the left side of the flag, there is a black horizontal triangle. 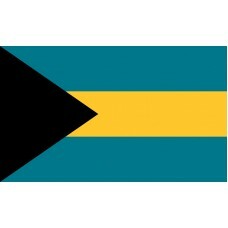 The flag was adopted and first raised on July 10th, 1973, when the Bahamas became independent from the United Kingdom. The aqua blue color on the flag is supposed to represent the ocean that surrounds the Bahamas and the yellow strip symbolizes the sandy beaches which are prominent throughout the 700 Bahamian islands. The black triangle represents the "strength, vigor and force" of the nation and the people's persistence to develop the island. When the Bahamas gained independence, the country changed its name from "Bahama Islands" to the "Bahamas" and a contest was held to design the new Bahamian flag. Instead of just one winner, the flag was a combination of elements from various entries. During the 18th – 19th Century, the Bahamas was a sanctuary for pirates, which the British eventually managed to suppress and The Bahamas was then made a British colony between 1718-1973. During this period, the British blue ensign was used, which had the Union Jack on it and the Bahamas badge. The badge illustrated a British ship chasing two pirate ships and around it, the motto "Expulsis Piratis Restituta Commercia" (pirates expelled, commerce restored), was used, which represented the banishment of the pirates. While the Bahamas was ruled by the British, following the American Independence war, American colonists began to occupy the island and they brought their slaves with them. The British abolished slavery in 1807 and it was eventually abolished in the Bahamas in 1834. Once slavery was abolished, the Bahamas became a refuge for the freed African slaves. The Bahamas lies on the Tropic of Cancer. It is known to have 340 days of sun a year and the temperature of the waters are always 26 degrees, no matter what the time of year is. The capital city of the Bahamas is Naussau and features some of the most beautiful sights and waters. Tourism is the main source of income in the Bahamas, and has made the Bahamas one of the richest countries in the Americas. The Bahamas is known to have the clearest waters in the world and the beaches have been voted many times "the best in the world." The Bahamas are also home to the Blue Lagoon Island, which is thought to be the main tourist attraction and "Dean's Blue Hole," which is the second deepest blue hole in the world. The famous and renowned "Lucayan National Park" is another major attraction and home to the longest underwater cave system in the world. A lot of tourists will also visit the island to see the famous "Junkanoo" carnival, which is celebrated each year December 26th and January 1st. During the period of slavery, each Christmas, the slaves would celebrate it with their families with dance, music and costumes and the "Junkanoo" carnival pays tribute to this. Thousands of people are involved in the street parade through Naussau each year, which begins around 1-2am and finishes at 9am. They will dance through the streets, wearing very detailed costumes and it has now become a very well-known tourist attraction.